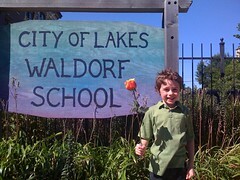 Today Elliot began his journey at City of Lakes Waldorf School. It commenced with a beautiful school assembly and rose ceremony to welcome the 1st graders into "The Grades." This is a big deal for many reasons, but most notably because this group of students and their teacher, Mr. Harris, will be together through to the 8th grade. A journey, indeed! Accompanied by live harp music at the Blaisdell Manor near school, each child was received by their previous kindergarten teacher (we missed you, Emma! ), escorted to an 8th grader to be given their welcoming rose, and then led under a bridge to Mr. Harris. At the end Mr. Harris led them out with song back to school to begin their first lesson. A very meaningful way to begin. Elliot put on his brave face. He has been telling me he is nervous and worried for a couple weeks now, and there were quiet tears to prove it this morning. Man that boy works hard! I couldn't have been prouder of him. Despite being emotionally overwhelmed and teary by the ceremony, and being one of three "new kids," he continued to exhale deeply, blowing away the sad and the worries. When he got to the other side of the bridge I received a small smile, wink and thumbs up from him. My big, big boy. I believe everyone at school now knows us as "the family of Elliot who made everyone cry at the Rose Ceremony." Multiple parents walked up to me and remarked how sweet Elliot is, and that they would be thinking of him all day. At pick up time Mr. Harris reported Elliot had a very good day, and that Elliot very clearly informed him that "Roses are usually red, you know. This one must not be ripe yet." Master Quinton also had an important morning of an open house in his room to meet his friends, have a small puppet show and drop off his slippers and spare clothes. His big first day is tomorrow. Despite our explaining ahead of time it sunk in with him this morning that he is NOT actually attending the same class as Elliot again this year. He told Dan after Elliot set off for his first lesson that "I'm not good because Elliot is gone." Bless his little brother heart. As for me, I'm exhausted. I put my mommy armor on this morning knowing I would need it. It's hard work to watch your anxious child work through life, modeling calm and peace for them while someone is taking an ice cream scoop to your insides. After an afternoon lunch picnic with his new friends and a 1st grade boy stick-gun game of Star Wars in the park (while all the liberal peace-loving Waldorf parents looked on), Elliot exclaimed, "Yeah! I go to the City of Lakes Waldorf School now!" I think he feels as though a small part of him already belongs.